GO down the path less travelled, on-road or off. Power through every job, big or small. Open up to more possibilities and more crew. Stop. Back it up. Take a look at what's directly behind you. Hitch up your weekend toys and go. The 2019 Nissan Frontier®. Toughness for the work site, rugged capability to take you OFF MAP. Frontier's full-length, fully boxed ladder frame is built for rock-solid performance—on, and off-road. It's made of impact-resistant materials that are both durable and stylish, like super-high-tensile-strength steel, and chrome on the rear bumper and front grille. Rear privacy glass adds a touch of attitude, while keeping it cool inside, and a tailgate-mounted rear spoiler helps helps reduce drag. It all amounts to a rugged exterior that's ready for whatever you dish out. 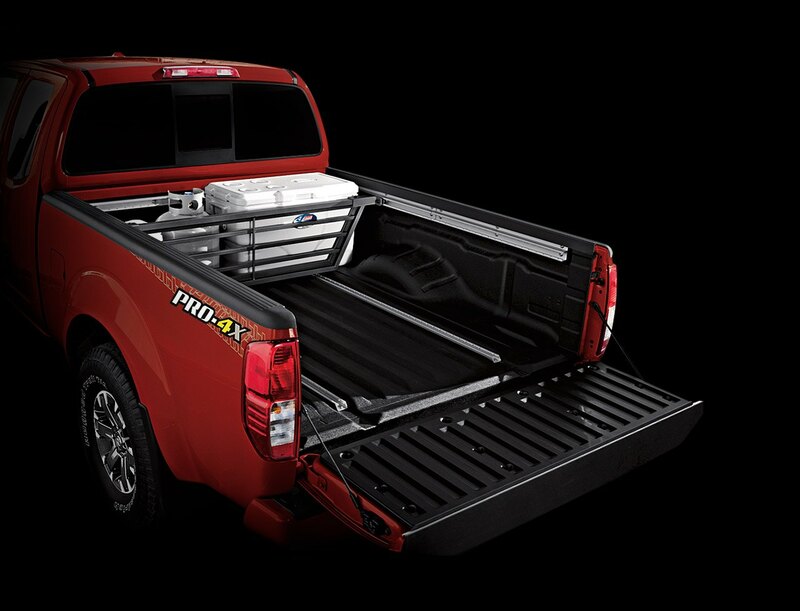 Nissan's available first-in-class Utili-track® cargo-carrying system holds a huge advantage over other trucks—channels on the bed floor, not just in the walls and header. For even more versatility, position the four beefy aluminum-alloy cleats anywhere along the Utili-track® Channel System, strap in your cargo, and put even the most awkward loads on lockdown. When you’ve got stuff that needs to get done, Frontier is up to the task but practicality and smart design doesn't come at the expense of comfort. The Crew Cab offers spacious seating for five, and the King Cab's doors open wide, making it easy to get in and out of the cabin. Smart design means rear doors that give your passengers easy access to the cabin. And with no B-pillars, you also get a huge opening for larger-than-life items. Power up your laptop or cell phone while simultaneously running a video game through the Frontier's three auxiliary power outlets. Maximize your cargo-carrying quotient. A 60/40 split flip-up rear bench seat—plus a flat loading floor—makes plenty of room when you're not carrying people. Pumping out up to 261 hp and 281 lb-ft of torque, Frontier’s V6 engine gets the job done. With a towing capacity of up to 3,043 kg (6,710 lbs), you can bring along just about anything you need. Whether you choose a Crew Cab Standard Bed, a King Cab Long Bed or a Crew Cab Long Bed, there’s plenty of room for cargo. And with an available factory-applied spray-on protective bed-liner, you won’t need to worry about tossing it in gently. Frontier also offers a 2.5-L 4-cylinder that pumps out 152 horsepower and 171 lb.-ft. of torque, and features a compact balancer system to deliver the smoothness of a V6. Exhibit championship form with Bilstein® off-road performance shocks, an electronic locking rear differential, 4-wheel Active Brake Limited Slip (ABLS), skid plates, and all-terrain tires. And with 16" 6-spoke alloy wheels, unique bedside decals, and an exclusive interior with white-faced gauges — PRO-4X looks the part. The Active Brake Limited Slip (ABLS) system senses wheelspin, then automatically applies the brakes to the spinning wheel and directs power to the wheels with more traction to help maintain steering control. When starting on an incline, available hill start assist can keep you from rolling backwards. It holds brake pressure for a few seconds, giving you time to switch from the brakes to the accelerator. Conversely, available hill descent control can help you drive down a steep grade in 4WD, by maintaining your speed and brake pressure. When 4x4 mode isn't enough, the PRO-4X®—Frontier's ultimate off-roader—delivers. Just flip the switch to activate the available electronic locking rear differential. This feature delivers equal power to both rear wheels to boost traction and help keep your truck moving forward. Available Bilstein® shocks were built to meet the demands of all your urban and off-road adventures. Their reputation for quality design means you’ll experience responsive handling and incredible comfort wherever Frontier takes you. Whether you're on the job or on the go, Frontier® meets your demands. Embrace a great-looking interior plus an available leather-wrapped steering wheel. Crank up the available Rockford Fosgate® -powered audio system.1 Make and take calls with your hands on the wheel using the Bluetooth® Hands Free Phone System. And get things the way you like it with available Dual Zone Automatic Temperature Control (ATC). 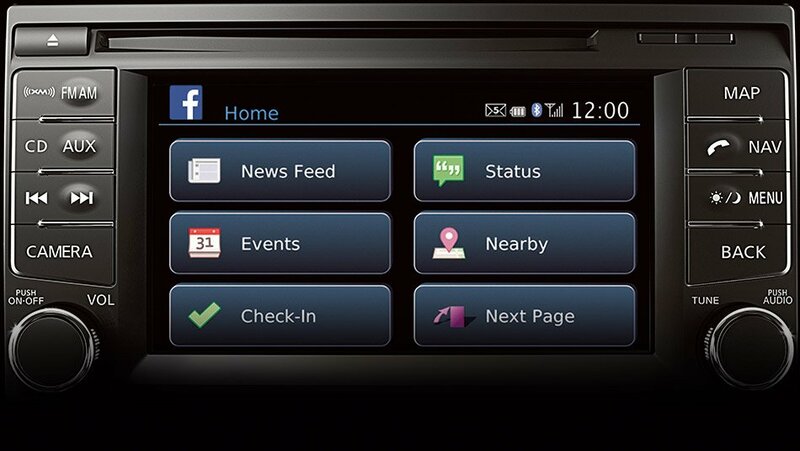 The available NissanConnect℠ is equipped with innovative features like hands-free phone capability, streaming audio, hands-free text messaging, a USB connection port, and navigation system with a 147 mm (5.8") colour display that serves up points of interest like restaurants, gas stations, and ATMs. 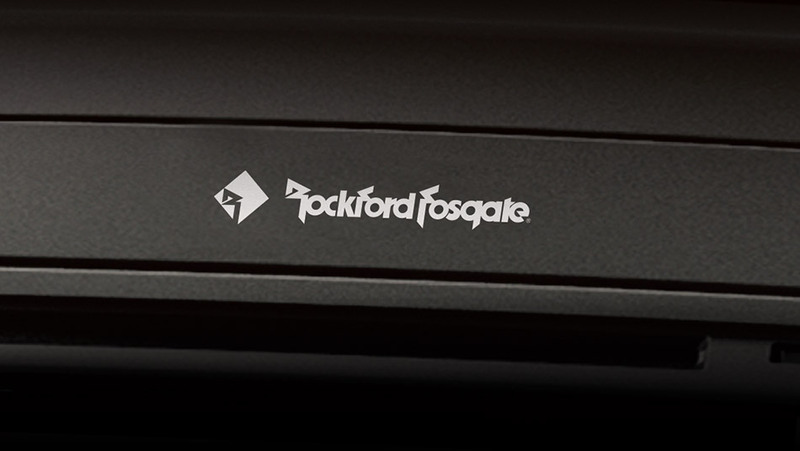 Tunes sound better through an available Rockford Fosgate® powered audio system, featuring eight speakers and two subwoofers. 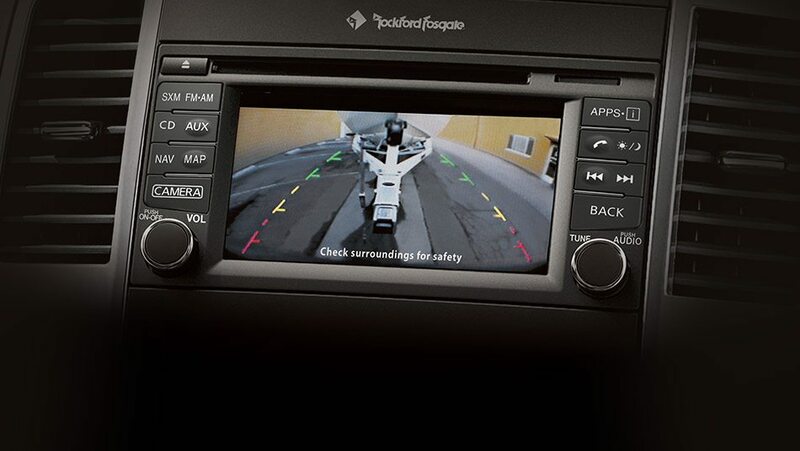 Frontier's available RearView Monitor helps you see what's behind you on the colour display—helping to make parking easier. This feature- sometimes called stability control- continuously monitors your steering and braking actions, senses any oversteer or understeer, and helps compensate by reducing engine speed and/or applying brake pressure to specific wheels. Nissan Advanced Air Bag System (AABS) includes dual-stage supplemental front air bags with seat belt sensors and an occupant-classification sensor. The inflation rate of these dual-stage air bags adjusts depending on crash severity and seat belt usage. Built into the front seats, two supplemental air bags offer side-impact protection and move with you as you adjust your seating position. Roof-mounted curtain side-impact supplemental air bags help provide head protection for both rows of outboard occupants. Get Your 2019 Nissan Frontier at Midway Nissan. Call us at (905) 668-6828 of fill out the form below to get best rates.